We were booked for the Shinkansen at 10:16. car 16. What we didn't realise that there are something like 10 shinkansens an hour between Kyoto and Tokyo. This takes about 2 3/4 hrs for the 400 or so Km (In fact the route is from Tokyo to the south west - Hakita a further 400 Km west of Kyoto). The train was virtually full, which is a lot of people travelling this route every day. And of course it was precisely on time at each end. We took the metro to our hotel - Only three stops but a change on the way. Lunch of noodles then we headed off to look for the Rei Harakami cd in the local emporium. Nearly success. They didn't have precisely the cd we wanted but three others. We bought the others. Then the metro to head for a LP-recomended small walking tour. An ice cream and a beer later, and a tea tasting and purchase later, we took a train to Shinjuku to visit a d.i.y. department store mention in the LP We finally discovered (after 5 days in all i Tokyo)that there are two metro systems run by two different companies, operating from the same station - we hadn't noted this on our first visit - and we had bought our tickets from the wrong machine, so we had to take a longer route with a change, rather than the direct train we had planned. A couple of kitchen tools and a present later, we struggled through the masses to the metro. "home" to the running sushi recommended by the hotel. 135 yen per plate, we ate 13, with beer, one of the cheapest meals we had experienced, and included squid, tune ... you mae it! Up early for the 2 hr journey to Narita airport, which lies some 50 km east of Tokyo. The easiest route from our hotel was to take one of the three local metro lines to its terminus (over 30 min), then change to a "limited express" for Narita (60 min). We made the same mistake as the day before and bought our tickets from the wrong machine. After a ticket refund new tickets from the right machine, we made it for the train! 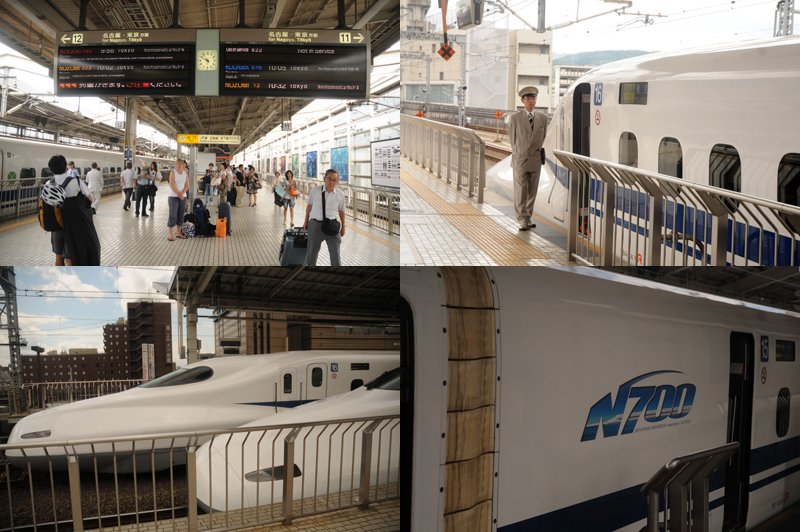 We had 5 minutes at the terminus (and 250 m with new signs regularly) and 60 minutes on the train, arriving at Narita exactly 2 hrs before our departure. Amazingly, we were not overweight in total, only in distribution - probably because David's heavy bits (Nikon lenses) were draped over Andrea's arm in a the rain jacket pocket .Final souvenirs - award-wining Japanese whisky and Sake - purchased, we boarded. SAS is somewhat more stingy than Austrian with respect to drinks - only an aperitif and wine for the meal. all others to be purchased! No wonder they are going bust.